Peter A. Indelicato, MD, former Wayne Huizenga Professor and Chief of Sports Medicine at the University of Florida received the 2016 Robert E. Leach Sports Medicine Leadership award, on Saturday, July 19, 2016 during the American Orthopaedic Society for Sports Medicine’s (AOSSM) Annual Meeting in Colorado Springs, Colorado. This prestigious award is given annually to honor those who have made a significant contribution to the world of sports medicine and includes a $5,000 donation to the winner’s charity of choice. Peter A. Indelicato, MD, former Wayne Huizenga Professor and Chief of Sports Medicine for the Department of Orthopaedic Surgery and Rehabilitation at the University of Florida received the 2016 Robert E. Leach Sports Medicine Leadership award on Saturday, July 19, 2016 during the American Orthopaedic Society for Sports Medicine’s (AOSSM) Annual Meeting in Colorado Springs, Colorado. This prestigious award is given annually to honor those who have made a significant contribution to the world of sports medicine and includes a $5,000 donation to the winner’s charity of choice. It is one of the top awards the Society presents each year. Dr. Indelicato is the 43rd recipient of this distinguished award. Dr. Indelicato attended New York Medical College and received his medical degree in 1969 then went on to complete his orthopedic residency training at New York University. Following residency, he spent two years in the US Navy as a staff orthopedic surgeon at NAS Corpus Christi, Texas. Upon completion of his Naval service, he went on to serve as a sports medicine fellow at the well-known Kerlan-Jobe Orthopaedic Clinic and had the opportunity to care for members of the Los Angeles Rams, Lakers, Dodgers and Kings. 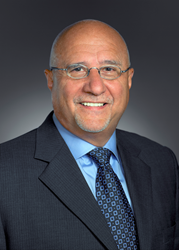 Dr. Indelicato was the associate team physician for the Miami Dolphins from 1988-1996 and retired as the head team physician for the University of Florida in 2012, a position he had held since 1977. He has been an active member of AOSSM having served on the Board of Directors and as president in 2011 along with multiple other committees since his membership began in 1983. He is also a member of the American Academy of Orthopaedic Surgeons, Herodicus Society (President 2007-2008), Florida Orthopaedic Society, National Athletic Trainers’ Association, Magellan Orthopaedic Society, Medical Advisory Committee- UF Athletic Association. Dr. Indelicato has lectured extensively around the country on the recognition and management of athletic knee and shoulder injuries. In addition, he has been an invited presenter/speaker at more than 400 conferences around the world.